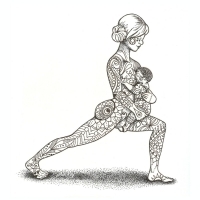 This class is designed for mothers to bring their baby on to the mat with them. Change diapers, nurse/bottle feed, do whatever you need to do no need to leave your mat during class. Our asana practice will include poses focused on stability, strength and reacquainting mothers with their pelvic floor and core, as well as fun opportunities to move with your baby. Women must be at least six weeks postpartum and/or have clearance from their physician to attend class. **While this class is designed with postpartum mothers in mind, we welcome partners, family, nannies or friends to attend. Class is suitable for babies up until they are mobile. Jessica Peeblson is a mother of four and has been teaching yoga since 2008. She completed her prenatal/postnatal yoga 45-hour program through MamaTree (San Francisco) in 2013, and graduated from the University of Montana with her BS in Human Biological Sciences in 2017. Most recently she re-certified as a yoga instructor through Atha Yoga Teacher Training locally with Kendra Potter in the fall/winter of 2018. Jessica is passionate about yoga-based education in the realms of parenting, birth, postpartum and everything in between.